Liber CLVIII THE SOLDIER AND THE HUNCHBACK ! AND ? INQUIRY. Let us inquire in the first place: What is Scepticism? The word means looking, questioning, investigating. One must pass by contemptuously the Christian liar's gloss which interprets “sceptic” as “mocker”; though in a sense it is true for him, since to inquire into Christianity is assuredly to mock at it; but I am concerned to intensify the etymological connotation in several respects. First, I do not regard mere incredulity as necessary to the idea, though credulity is incompatible with it. Incredulity implies a prejudice in favour of a negative conclusion; and the true sceptic should be perfectly unbiassed. Second, I exclude “vital scepticism.” What's the good of anyfink? expects (as we used to learn about “nonne?”) the answer, “Why nuffink!” and again is prejudiced. Indolence is no virtue in a questioner. Eagerness, intentness, concentration, vigilance — all these I include in the connotation of “sceptic.” Such questioning as has been called “vital scepticism” is but a device to avoid true questioning, and therefore its very antithesis, the devil disguised as an angel of light. I picture the false sceptic as a dude or popinjay, yawning, with dull eyes, his muscles limp, his purpose in asking the question but the expression of his slackness and stupidity. This true sceptic is indeed the man of science; as Wells' “Moreau” tells us. He has devised some means of answering his first question, and its answer is another question. It is difficult to conceive of any question, indeed, whose answer does not imply a thousand further questions. So simple an inquiry as “Why is sugar sweet?” involves an infinity of chemical researches, each leading ultimately to the blank wall — what is matter? and an infinity of physiological researches, each (similarly) leading to the blank wall — what is mind? Even so, the relation between the two ideas is unthinkable; causality is itself unthinkable; it depends, for one thing, upon experience — and what, in God's name, is experience? Experience is impossible without memory. What is memory? The mortar of the temple of the ego, whose bricks are the impressions. And the ego? The sum of our experience, may be. (I doubt it!) Anyhow, we have got values of “y” and “z” for “x”, and the values of “x” and “z” for “y” — all our equations are indeterminate; all our knowledge is relative, even in a narrower sense than is usually implied by the statement. Under the whip of the clown God, our performing donkeys the philosophers and men of science run round and round in the ring; they have amusing tricks: they are cleverly trained; but they get nowhere. I don't seem to be getting anywhere myself. A fresh attempt. Let us look into the simplest and most certain of all possible statements. “Thought exists”, or if you will, “Cogitatur”. Examining more closely this statement, we may still cavil at its form. We cannot translate it into English without the use of the verb to be, so, that, after all, existence is implied. Nor do we readily conceive that contemptuous silence is sufficient answer of the further query, “By whom is it thought?” The Buddhist may find it easy to image an act without an agent; I am not so clever. It may be possible for a sane man; but I should like to know more about his mind before I gave a final opinion. But apart from purely formal objections, we may still inquire: Is this “Cogitatur” true? Yes; reply the sages; for to deny it implies thought; “Negatur” is only a sub-section of “Cogitatur”. This involves, however, an axiom that the part is of the same nature as the whole; or (at the very least) an axiom that “A” is “A”. Now, I do not wish to deny that “A” is “A”, or may occasionally be “A”. But certainly “A is A” is a very different statement to our original “Cogitatur”. The proof of “Cogitatur”, in short, rests not upon itself but upon the validity of our logic; and if by logic we mean (as we should mean) the Code of the Laws of Thought, the irritating sceptic will have many more remarks to make: for it now appears that the proof that “thought exists” depends upon the truth of that which is thought, to say no more. We have taken “Cogitatur”, to try and avoid the use of “esse;” but “A is A” involves that very idea, and the proof is fatally flawed. “Cogitatur” depends on “Est;” and there's no avoiding it. Shall we get on any better if we investigate this “Est” — Something is — Existence is — אהיה אשר ;אהיה [Heh-Yod-Heh-Aleph Resh-Shin-Aleph Heh-Yod-Heh-Aleph] ? What is Existence? The question is so fundamental that it finds no answer. The most profound meditation only leads to an exasperating sense of impotence. There is, it seems, no simple rational idea in the mind which corresponds to the word. “Existence is the opposite of Non-Existence,” do not help us much! The plain “Existence is Existence” of the Hebrews goes farther. It is the most sceptical of statements, in spite of its form. Existence is just existence, and there's no more to be said about it; don't worry! Ah, but there is more to be said about it! Though we search ourselves for a thought to match the word, and fail, yet we have Berkeley's perfectly convincing argument that (so far as we know it) existence must mean “thinking existence” or “spiritual existence”. Here then we find our “Est” to imply “Cogitatur;” and Berkeley's arguments are “irrefragable, yet fail to produce conviction” (Hume) because the “Cogitatur;” as we have shown, implies “Est”. Neither of these ideas is simple; each involves the other. Is the division between them in our brain a proof of the total incapacity of that organ, or is there some flaw in our logic? For all depends upon our logic; not upon the simple identity “A is A” only, but upon its whole structure from the question of simple propositions, enormously difficult from the moment when it occurred to the detestable genius that invented “existential import” to consider the matter, to that further complexity and contradiction, the syllogism. There is denial of thought. (All) Denial of thought is thought. Even formally, 'tis a clumsy monster. Essentially, it seems to involve a great deal beyond our original statement. We compass heaven and earth to make one syllogism; and when we have made it, it is tenfold more the child of mystery than ourselves. We cannot here discuss the whole problem of the validity (the surface- question of the logical validity) of the syllogism; though one may throw out the hint that the doctrine of distributed middle seems to assume a knowledge of a Calculus of Infinites which is certainly beyond my own poor attainments, and hardly impregnable to the simple reflection that all mathematics is conventional, and not essential; relative, and not absolute. We go deeper and deeper, then, it seems, from the One into the Many. Our primary proposition depends no longer upon itself, but upon the whole complex being of man, poor, disputing, muddle-headed man! Man with all his limitations and ignorance; man — man! We are of course no happier when we examine the Many, separately or together. They converge and diverge, each fresh hill-toÿ of knowledge disclosing a vast land unexplored; each gain of power in our telescopes opening out new galaxies; each improvement in our microscoÿes showing us life minuter and more incomprehensible. A mystery of the mighty spaces between molecules; a mystery of the ether-cushions that fend off the stars from collision! A mystery of the fulness of things; a mystery of the emptiness of things! Yet, as we go, there grows a sense, an instinct, a premonition — what shall I call it? — that Being is One, and Thought is One, and Law is One — until we ask What is that One? Then again we spin words — words — words. And we have got no single question answered in any ultimate sense. “Greenness” depends on the sunlight, and the eye, and a thousand other things. “Cheese” depends on bacteria and fermentation and the nature of the cow. Shall we cut the Gordian knot? shall we say “There is God”? What, in the devil's name, is God? If (with Moses) we picture Him as an old man showing us His back parts, who shall blame us? The great Question — “any” question is the great question — does indeed treat us thus cavalierly, the disenchanted Sceptic is too prone to think! Well, shall we define Him as a loving Father, as a jealous priest, as a gleam of light upon the holy Ark? What does it matter? All these images are of wood and stone, the wood and stone of our own stupid brains! The Fatherhood of God is but a human type; the idea of a human father conjoined with the idea of immensity. Two for One again! No combination of thoughts can be greater than the thinking brain itself; all we can think of God or say of Him, so long as our words really represent thoughts, is less than the whole brain which thinks, and orders speech. Very good; shall we proceed by denying Him all thinkable qualities, as do the heathen? All we obtain is mere negation of thought. Either He is unknowable, or He is less than we are. Then, too, that which is unknowable is unknown; and “God” or “There is God” as an answer to our question becomes as meaningless as any other. We are Spencerian Agnostics, poor silly, damned Spencerian Agnostics! And there is an end of the matter. It is surely time that we began to question the validity of some of our data. So far our scepticism has not only knocked to pieces our tower of thought, but rooted up the foundation-stone and ground it into finer and more poisonous powder than that into which Moses ground the calf. These golden Elohim! Our calf-heads that brought us not out of Egypt, but into a darkness deeper and more tangible than any darkness of the double Empire of Asar. Hume put his little ? to Berkeley's God-! ; Buddha his ? to the Vedic Atman-! — and neither Hume nor Buddha was baulked of his reward. Ourselves may put ? to our own ? since we have found no ! to put it to; and wouldn't it be jolly if our own second ? suddenly straightened its back and threw its chest out and marched off as !? Suppose then we accept our scepticism as having destroyed our knowledge root and branch — is there no limit to its action? Does it not in a sense stultify itself? Having destroyed logic by logic — if Satan cast out Satan, how shall his kingdom stand? Let us stand on the Mount, Saviours of the World that we are, and answer “Get thee behind me Satan!” though refraining from quoting texts or giving reasons. Oho! says somebody; is Aleister Crowley here? — Samson blinded and bound, grinding corn for the Philistines! Not at all, dear boy! We shall put all the questions that we can put — but we may find a tower built upon a rock, against which the winds beat in vain. Not what Christians call faith, be sure! But what (possibly) the forgers of the Epistles — those eminent mystics! — meant by faith. What I call Samadhi — and as “faith without works is dead,” so, good friends, Samadhi is all humbug unless the practitioner shows the glint of its gold in his work in the world. If your mystic becomes Dante, well; if Tennyson, a fig for his trances! But how does this tower of Samadhi stand the assault of Question-time? Is not the idea of Samadhi just as dependent on all the other ideas — man, time, being, thought, logic? If I seek to explain Samadhi by analogy, am I not often found talking as if we knew all about Evolution, and Mathematics, and History? Complex and unscientific studies, mere straws before the blast of our hunchback friend! Well, one of the buttresses is just the small matter of common sense. The other day I was with Dorothy, and, as I foolishly imagined, very cosy: for her sandwiches are celebrated. It was surely bad taste on the part of Father Bernard Vaughan, and Dr. Torrey, and Ananda Metteyya, and Mr. G. W. Foote, and Captain Fuller, and the ghost of Immanuel Kant, and Mr. Bernard Shaw, and young Neuburg, to intrude. But intrude they did; and talk! I never heard anything like it. Every one with his own point of view; but all agreed that Dorothy was non-existent, or if existent, a most awful specimen, that her buns were stale, and her tea stewed; “ergo,” that I was having a very poor time of it. Talk! Good God! But Dorothy kept on quietly and took no notice; and in the end I forgot about them. Thinking it over soberly, I see now that very likely they were quite right: I can't prove it either way. But as a mere practical man, I intend taking the steamer — for my sins I am in Gibraltar — back to Dorothy at the earliest possible moment. Sandwiches of bun and German sausage may be vulgar and even imaginary — it's the taste I like. And the more I munch, the more complacent I feel, until I go so far as to offer my critics a bite. This sounds in a way like the “Interior Certainly” of the common or garden Christian; but there are differences. The Christian insists on notorious lies being accepted as an essential part of his (more usually her) system; I, on the contrary, ask for facts, for observation. Under Scepticism, true, one is just as much a house of cards as the other; but only in the philosophical sense. Practically, Science is is true; and Faith is foolish. Practically, 3 x 1 = 3 is the truth; and 3 x 1 = 1 is a lie; though, sceptically, both statements may be false or unintelligible. Practically, Franklin's method of obtaining fire from heaven is better than that of Prometheus or Elijah. I am now writing by the light that Franklin's discovery enabled men to use. My claim, too, is more modest than the Christian's. He (usually she) knows more about my future than is altogether pleasant; I claim nothing absolute from my Samadhi — I know only too well the worthlessness of single-handed observations, even on so simple a matter as a boiling- point determination! — and as for his (usually her) future, I content myself with mere common sense about the probable end of a fool. So that after all I keep my scepticism intact - and I keep my Samadhi intact. The one balances the other; I care nothing for the vulgar brawling of these two varlets of my mind! If, however, you would really like to know what might be said on the soldierly side of the question, I shall endeavour to oblige. It is necessary if a question is to be intelligibly put that the querent should be on the same plane as the quesited. Answer is impossible if you ask: Are round squares triangular? or Is butter virtuous? or How many ounces go to the shilling? for the “questions” are not really questions at all. So if you ask me Is Samadhi real? I reply: First, I pray you, establish a connection between the terms. What do you mean by Samadhi? There is a physiological (or pathological; never mind now!) state which I call Samadhi; and that state is as real - in relation to man - as sleep, or intoxication, or death. Philosophically, we may doubt the existence of all of these; but we have no grounds for discriminating between them - the Academic Scepticism is a wholesale firm, I hope! - and practically, I challenge you to draw valid distinctions. All these are states of the consciousness of man; and if you seek to destroy one, all fall together. I must, at the risk of appearing to digress, insist upon this distinction between philosophical and practical points of view, or (in Qabalistic language) between Kether and Malkuth. In private conversation I find it hard - almost impossible - to get peoÿle to understand what seems to me so very simple a point. I shall try to make it exceptionally clear. A boot is an Illusion. A hat is an illusion. “Therefore,” a boot is a hat. So argue my friends, not distributing the middle term. “Therefore” (though it is not a syllogism), all boots and hats are illusions. To the man in Kether no illusions matter. “Therefore:” To the man in Kether neither boots nor hats matter. In fact, the man in Kether is out of all relation to these boots and hats. You, they say, claim to be a man in Kether (I don't). Why then, do you not wear boots on your head and hats on your feet? I can only answer that I the man in Kether ('tis but an argument) am out of all relation as much with feet and heads as with boots and hats. But why should I (from my exalted pinnacle) stoop down and worry the headed and footed gentleman in Malkuth, who after all doesn't exist for me, by these drastic alterations in his toilet? There is no distinction whatever; I might easily put the boots on his shoulders, with his head on one foot and the hat on the other. In short, why not be a clean-living Irish gentleman, even if you do have insane ideas about the universe? Very good, say my friends, unabashed, then why not stick to that? Why glorify Spanish gipsies when you have married a clergyman's daughter? Why go about proclaiming that you can get as good fun for eighteenpence as usually costs men a career? Ah! let me introduce you to the man in Tiphereth; that is, the man who is trying to raise his consciousness from Malkuth to Kether. This Tiphereth man is in a devil of a hole! He knows theoretically all about the Kether point of view (or thinks he does) and practically all about the Malkuth point of view. Consequently he goes about contradicting Malkuth; he refuses to allow Malkuth to obsess his thought. He keeps on crying out that there is no difference between a goat and a God, in the hope of hypnotising himself (as it were) into that perception of their identity, which is his (partial and incorrect) idea of how things look from Kether. This man performs great magic; very strong medicine. He does really find gold on the midden and skeletons in pretty girls. In Abiegnus the Sacred Mountain of the Rosicrucians the Postulant finds but a coffin in the central shrine; yet that coffin contains Christian Rosencreutz who is dead and is alive for evermore and hath the keys of Hell and of Death. Ay! your Tiphereth man, child of Mercy and Justice, looks deeper than the skin! But he seems a ridiculous object enough both to the Malkuth man and to the Kether man. Still, he's the most interesting man there is; and we all must pass through that stage before we get our heads really clear, the Kether-vision above the Clouds that encircle the mountain Abiegnus. Running and returning, like the Cherubim, we may now resume our attempt to drill our hunchback friend into a presentable soldier. The digression will not have been all digression, either; for it will have thrown a deal of light on the question of the limitations of scepticism. We have questioned the Malkuth point of view; it appears absurd, be it agreed. But the Tiphereth position is unshaken; Tiphereth needs no telling that Malkuth is absurd. When we turn our artillery against Tiphereth, that too crumbles; but Kether frowns above us. Attack Kether, and it falls; but the Yetziratic Malkuth is still there …. until we reach Kether of Atziluth and the Infinite Light, and Space, and Nothing. So then we retire up the path, fighting rear-guard actions; at every moment a soldier is slain by a hunchback; but as we retire there is always a soldier just by us. Until the end. The end? Buddha thought the supply of hunchbacks infinite; but why should not the soldiers themselves be infinite in number? However that may be, here is the point; it takes a moment for a hunchback to kill his man, and the farther we get from our base the longer it takes. You may crumble to ashes the dream-world of a boy, as it were, between your fingers; but before you can bring the physical universe tumbling about a man's ears he requires to drill his hunchbacks so devilish well that they are terribly like soldiers themselves. And a question capable of shaking the consciousness of Samadhi could, I imagine, give long odds to one of Frederick's grenadiers. It is useless to attack the mystic by asking him if he is quite sure Samadhi is good for his poor health; 'tis like asking the huntsman to be very careful, please, not to hurt the fox. The ultimate Question, the one that really knocks Samadhi to pieces, is such a stupendous Idea that it is far more of a ! than all previous ! 's whatever, for all its ? form. And the name of that Question is Nibbana. Take this matter of the soul. When Mr. Judas McCabbage asks the Man in the Street why he believes in a soul, the Man stammers out that he has always heard so; naturally McCabbage has no difficulty in proving to him by biological methods that he has no soul; and with a sunny smile each passes on his way. But McCabbage is wasted on the philosopher whose belief in a soul rests on introspection; we must have heavier metal; Hume will serve our turn, may be. But Hume in his turn becomes perfectly futile, pitted against the Hindu mystic, who is in constant intense enjoyment of his new-found Atman. It takes a Buddha-gun to knock “his” castle down. Now the ideas of McCabbage are banal and dull; those of Hume are live and virile; there is a joy in them greater than the joy of the Man in the Street. So too the Buddha-thought, Anatta, is a more splendid conception than the philosopher's Dutch-doll-like Ego, or the rational artillery of Hume. This weapon, too, that has destroyed our lesser, our illusionary universes, ever revealing one more real, shall we not wield it with divine ecstasy? Shall we not, too, perceive the inter-dependence of the Questions and the Answers, the necessary connection of the one with the other, so that (just as 0 x ì is an indefinite) we destroy the absolutism of either ? or ! by their alternation and balance, until in our series ? ! ? ! ? ! ? … ! ? ! ? … we care nothing as to which may prove the final term, any single term being so negligible a quantity in relation to the vastness of the series? Is it not a series of geometrical progression, with a factor positive and incalculably vast? In the light of the whole process, then, we perceive that there is no absolute value in the swing of the pendulum, thought its shaft lengthen, its rate grow slower, and its sweep wider at every swing. What should interest us is the consideration of the Point from which it hangs, motionless at the height of things! We are unfavourably placed to observe this, desperately clinging as we are to the bob of the pendulum, sick with our senseless swinging to and fro in the abyss! We must climb up the shaft to reach that point — but — wait one moment! How obscure and subtle has our simile become! Can we attach any true meaning to the phrase? I doubt it, seeing what we have taken for the limits of the swing. True, it may be that at the end the swing is always 360ø so that the !-point and the ?-point coincide; but that is not the same thing as having no swing at all, unless we make kinematics identical with statics. What is to be done? How shall such mysteries be uttered? Is this how it is that the true Path of the Wise is said to lie in a totally different plane from all his advance in the path of Knowledge, and of Trance? We have already been obliged to take the Fourth Dimension to illustrate (if not explain) the nature of Samadhi. Ah, say the adepts, Samadhi is not the end , but the beginning. You must regard Samadhi as the normal state of mind which enables you to begin your researches, just as waking is the state from which you rise to Samadhi, sleep the state from which you rose to waking. And only from Sammasamadhi — continuous trance of the right kind — can you rise up as it were on tiptoe and peer through the clouds unto the mountains. Now of course it is really awfully decent of the adepts to take all that trouble over us, and to put it so nicely and clearly. All we have to do, you see, is to acquire Sammasamadhi, and then rise on tiptoe. Just so! But there there are the other adepts. Hard at him! Little brother, he says, let us rather consider that as the pendulum swings more and more slowly every time, it must ultimately stop, as soon as the shaft is of infinite length. Good! then it isn't a pendulum at all but a Mahalingam — The Mahalingam of Shiva (“Namo Shivaya namaha Aum!”) which is all I ever thought it was; all you have to do is to keep swinging hard — I know it's hook-swinging! — and you get there in the End. Why trouble to swing? First, because you are bound to swing, whether you like it or not; second, because your attention is thereby distracted from those lumbar muscles in which the hook is so very firmly fixed; third, because after all it's a ripping good game; fourth, because you want to get on, and even to seem to progress is better than standing still. A treadmill is admittedly good exercise. True, the question, “Why become an Aarhat?” should precede, “How become an Arahat?” but an unbiassed man will easily cancel the first question with “Why not?” — the How is not so easy to get rid of. Then, from the standpoint of the Arahat himself, perhaps this “Why did I become an Arahat?” and “How did I become an Arahat?” have but a single solution! In any case, we are wasting our time — we are as ridiculous with our Arahats as Herod the Tetrarch with his peacocks! We pose Life with the question Why? and the first answer is: To obtain the Knowledge and Conversation of the Holy Guardian Angel. To attach meaning to this statement we must obtain that Knowledge and Conversation: and when we have done that, we may proceed to the next Question. It is no good asking it now. We attach little importance to the Reverend Out-at-Elbows, thundering in Bareboards Chapel that the rich man gets no enjoyment from his wealth. Good, then. 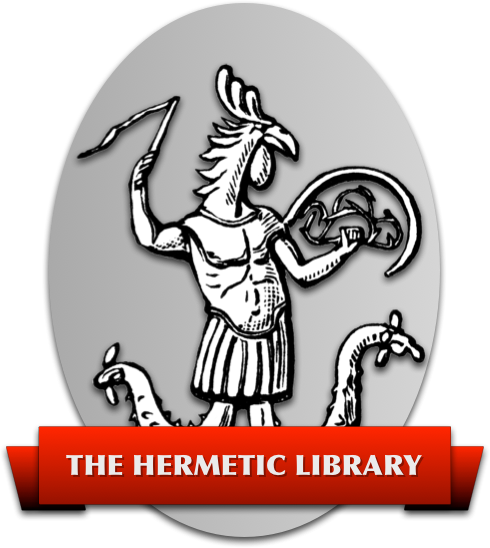 Let us obtain the volume entitled “The Book of the Sacred Magick of Abramelin the Mage”; or the magical writings of that holy illuminated Man of God, Captain Fuller, and carry out fully their instructions. And only when we have succeeded, when we have put a colossal ! against our vital ? need we inquire whether after all the soldier is not going to develoÿ spinal curvature. The distant path; one step's enough for me.” But (you will doubtless say) I pith your ? itself with another ? : Why question life at all? Why not remain “a clean-living Irish gentleman” content with his handicap, and contemptuous of card and pencil? Is not the Buddha's goad “Everything is sorrow” little better than a currish whine? What do I care for old age, disease, and death? I'm a man, and a Celt at that. I spit on your snivelling Hindu prince, emasculate with debauchery in the first place, and asceticism in the second. A weak, dirty, paltry cur, sir, your Gautama! I am not so foolish as to think that my doctrine can ever gain the ear of the world. I expect that ten centuries hence the “nominal Crowleians” will be as pestilent and numerous a body as the “nominal Christians” are to-day; for (at present) I have been able to devise no mechanism for excluding them. Rather, perhaps, should I seek to find them a niche in the shrine, just as Hinduism provides alike for those capable of the Upanishads and those whose intelligence hardly reaches to the Tantras. In short, one must abandon the reality of religion for a sham, so that the religion may be universal enough for those few who are capable of its reality to nestle to its breast, and nurse their nature on its starry milk. But we anticipate! My message is then twofold; to the greasy “bourgeois” I preach discontent; I shock him, I stagger him, I cut away earth from under his feet, I turn him upside down, I give him hashish and make him run amok, I twitch his buttocks with the red-hot tongs of my Sadistic fancy – until he feels uncomfortable. But to the man who is already as uneasy as St. Lawrence on his silver grill, who feels the spirit stir in him, even as a woman feels, and sickens at, the first leap of the babe in her womb, to him I bring the splendid vision, the perfume and the glory, the Knowledge and Conversation of the Holy Guardian Angel. And to whosoever hath attained that height will I put a further Question, announce a further Glory. It is my misfortune and not my fault that I am bound to deliver this elementary Message. We must pardon Browning his bawdy jest; for his truth is ower true! But it is your own fault if you are the world instead of the beloved; and only see of me what Moses saw of God! But let us take a less unpleasing metaphor, the whip! As some schoolboy poet repeatedly wrote, his rimes as poor as Edwin Arnold, his metre as erratic and as good as Francis Thompson, his good sense and frank indecency a match for Browning! Nay! 'tis a bad, bad rime. And only after the scourge that smites shall come the rod that consoles, if I may borrow a somewhat daring simile from Abdullah Haji of Shiraz and the twenty-third Psalm. Well, I would much prefer to spend my life at the rod; it is wearisome and loathsome to be constantly flogging the tough hide of Britons, whom after all I love. “Whom the Lord loveth He chasteneth, and scourgeth every son that He receiveth.” I shall really be glad if a few of you will get it over, and come and sit on daddy's knee! Little brother, give me thy hand; for the first step is hard.